Michael Smith is known to many people in Australia for his two cinemas near Melbourne - the Sun Theatre Yarraville and the Sun Cinema Bairnsdale. 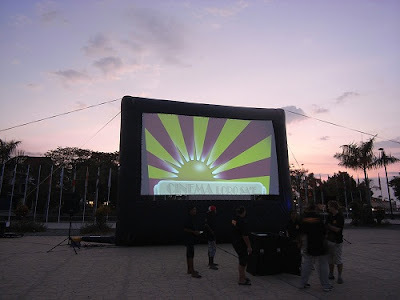 In August 2011, he decided to bring movies to the masses in Timor-Leste, with a three-month trial season of outdoor cinema exhibition around the country. Films were screened in Dili and 23 towns and villages across Timor-Leste to a total of 45,000 people over the season. For many it was their first movie experience. As Kirsty Sword Gusmao commented: “Movies offer a window on the world, a world of culture and values that promise to transport the families of Timor Leste beyond their everyday experiences.” Screenings were free of charge and film programming was designed to appeal broadly to the local audience, with most films shown with Tetum dubbing. A pre-show programme of sponsor slides, locally made shorts, the President’s Hero stories, Tour de Timor and Dili Motocross highlights videos all proved to be extremely popular. The support of in-kind sponsors was greatly appreciated and critical for the success of the season. It's a program we started last year to bring movies to Timor Leste. Our aim is to get as many people together each night to enjoy the communal experience of watching the short films and the movie. Last year was a trial, so we experimented with showing a range of films, both in Dili and the districts. This year are going to focus our efforts on the districts; we want to screen in as many little towns and villages around the country as possible during the dry season. I also love the name, which was suggested by a friend Greg in Melbourne, who I travelled to Dili with on my first trip. When our cinema in Melbourne is the Sun Theatre, with a rising neon Sun atop the building, and the Sun image an Icon of the West of Melbourne, it fits perfectly. How do you actually show the movies? We do it in public areas with a large inflatable screen and digital projection equipment. We had everything we needed in Melbourne, and Timor's dry season is the opposite season the Melbourne's dry season, which worked well. It turned out the President [Jose Ramos-Horta] already had an inflatable screen in Dili, so we arranged with his office that we would use that one as they are large and cumbersome to ship around. So we shipped our projection gear up from the Sun with Toll's assistance, and then brought my head projectionist up from Melbourne to train our local staff. They picked up all the operations so quickly I was really impressed, and apart from when I have been visiting, it has just been our team of locals running the program. We prepare the digital files with short films and features down in Melbourne, then send hard drives up ready to be screened. As I mentioned, a pretty broad range in the first year, as we were testing what worked. So films of different styles, like the animated movies Happy Feet and Owls of Gahoule, films with local interest, such as Balibo and Barefoot Dream, some comedies and action adventure films, Africa United was outstanding: well-received and lots of fun. Interestingly, one film requested a few times was Karate Kid with Jackie Chan, as it was felt it had a good message of self discipline. We like to talk to the District Administrator when we arrive in town and consult them about which of the films they think will be appropriate. We also have a great pre-show program of short films. We always start with some beautiful underwater footage provided by Timor-Leste's National Directorate of Tourism, then things like the Tour de Timor cycle race highlights, some educational shorts and what was really popular was the 5-minute comedy drama Vagabond, made by Dili Film Works and directed by Bety Reis. It is hilarious and the crowds would laugh and squeal with delight watching this. When did you first become interested in showing movies in Timor-Leste? A few years ago we showed the movie Balibo at our cinema in Melbourne. Up until then East Timor was a memory from the news of many years ago, but I found the story very moving and I wanted to do more about it. I then had an old friend suggest that it would be good to show some movies up there, so in 2010 went on a research trip. The old cinema in Dili was found and discounted as an option as it was not only wrecked but now used by a sports club. There were a few options investigated for indoor screenings, but these would only have been in Dili, and I was keen to take movies to the whole country. The obvious choice was to do a portable outdoor cinema. You run a cinema in Melbourne, was outdoor cinema something you had done before? Yes, I've always loved outdoor movies, my first involvement was setting one up for a chum in Perth, and then started doing some of our own. For many years, before we had reestored the Sun Theatre, we used to close the street in front and show a free movie on New Year's Eve and during the annual Yarraville Festival. These had a great response and were a wonderful community event. I helped set up other outdoor cinemas for clients and recently have been involved in the very special Movies In The Vineyard program, where you watch films under the stars, at a winery, with a bottle of red and a picnic, it is really magical. The Cinema Lorosa'e screenings are free: how is it funded? Oh, we underwrite the costs from the Sun Theatre, and have been seeking sponsors and supporters to help. We have had some great in-kind sponsorship from Toll, Rentlo and Timor Telecom in Dili, I can't imagine making it through last season without their help. Other support has come from home, with a friend making his studio available for the dubbing of some films, and the Sun Theatre patrons and Yarraville community have been fabulous in their support of fundraising activities such as auctions, special screenings and raffles. Even the film companies have been great, some producers allowing us to screen their films for free, and the studio films at the smallest reduced rate they could do. You mention you have dubbed some of the films into Tetum, tell us more about that? Ha, that was my classic naivety in trying to be a "Yes man"! A few people asked on my first trip "what language will the films be in, it would be great if they were in Tetum". I think I probably was non committal until I met with Kirsty Sword Gusmao on a later trip and said "of course we'll translate the films", I then went and worked out how to do it. Rob Connely, the Director of Balibo (which was already available in Tetum) was helpful and referred me to some of the actors from Balibo who lived in Melbourne, and Craig from Magic Sound Company in Yarraville made his studio and himself available on weekends to dub a few films. This turned out to be a huge amount of work, which was very generous, but so rewarding when you see a crowd of hundreds of people following the movie in their own language. In fact I thought it was funny role reversal that when I went with the team out to the districts, I and the few foreigners in the crowd read the English subtitles while everyone else listened in Tetum! What were the highlights of last year for you? Oh there are so many... I mean, nothing makes me happier than seeing a large crowd enjoying a film. Whether it's at home in Melbourne or here in Timor, that is always pleasing. But to focus more on what specifically was rewarding about Cinema Lorosa'e, getting out to the districts, and offering a community event, where people of all ages are coming out and enjoying a film as a group, is great. Going to Balibo and showing Balibo, right beneath the Fort was one of the key memories I'll carry around for a while. What's in the works for this year then? We are kicking the season off over the May 20 weekend that celebrates 10 years of independence. We then have a program through to end of November that will see us on the road three weeks out of four, mainly in the districts. The team is really excited to get started again! The program for 2012 will run from late May to early November. The focus on screenings will shift from Dili to the Districts. This will allow us to get to as many villages as possible and to screen in larger towns more than once. Screenings in Dili will be reduced from three per week to a few per month, which will allow the team to conduct around three times as many District screenings this year. The ongoing support of the Government and sponsors is needed for the viability of the project. Fundraising is being conducted via the Sun Theatre in Melbourne to support funds for costs such as fuel, accommodation and wages for the local staff. Our long term aim is for the business is to be financially sustainable and run by local people.